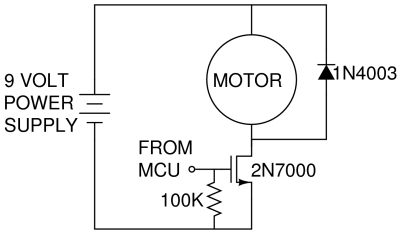 I need an H-bridge to run a dc motor both directions. The basics of the H-bridge seem trivial and very cool: H-bridge at Wikipedia. But it seemed less trivial where the flyback diodes should go. But with an H-bridge, the application of flyback diodes seemed less trivial. 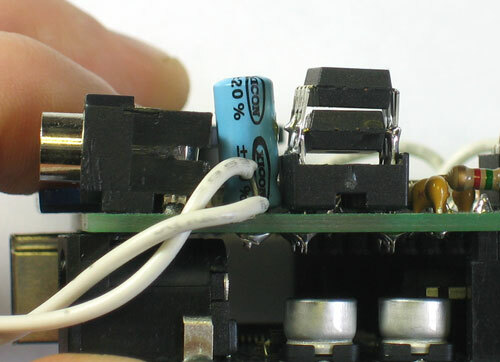 But I've found this article, and they get to flyback diodes toward the bottom, just before the last image. The arrangement of flyback diodes is cool; try going through the through the thought experiments of the motor being turned off from running each direction. Even cooler, is that it seems the mosfet's built-in diodes handle this. Now to actually implement this, I'm looking for assistance on what components to buy. The article mentions that "N-Channel Mosfets are much cheaper than P-Channel Mosfets". So does it make more sense to buy a pair of P-Channel mosfets or just an H-bridge chip? 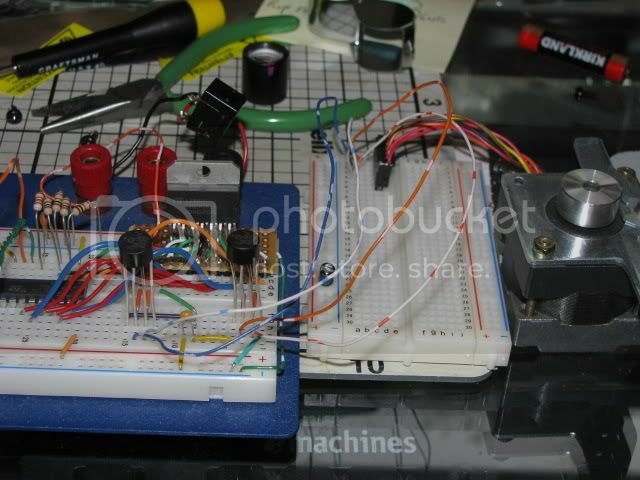 I plant to PWM my motor at 12V. It's unlabeled and a little bigger than a 35mm film canister. It's very weak at 5v, but is decent at 12V. Brick source = 12.1V, while running motor voltage drops to 10.7V, using 185ma. ~2W. Well, that was a big oops. An accidental keystroke posted my message while I was editing the title and not done with the body. Ah well. So, for bidirectional DC motor control, is the Intersil HIP4082 a decent choice? (given my motor info mentioned above). And I'm confused by the "Typical Application (PWM Mode Switching)" illustration on page 3 of the pdf. It looks like, connected to the load, there are somethings/mosfets(?) outside of the HIP4082 chip? I was hoping an H-bridge chip incorporated the 4 mosfets, and that just a pair of leads on the H-bridge chip would go to the pair of motor leads, giving you bidirectional motion. The L293D seems so appealing I'm about to buy one. The block diagram is on page 2 of the pdf. Here are my newbie guesses: It seems pin1 enables half-H's 1 & 2 to function. Half-H 1 seems to be controlled via on/off signal on pin2, creating output on pin3 of Vcc2-or-0V to motor lead. Half-H 2 seems to be controlled via on/off signal on pin7, creating output on pin6 of Vcc2-or-0v to other motor lead. Please correct me wherever I'm clueless or off-base! Also, it appears one must use external flyback/protection diodes with the L293. But it seems the L293D has flyback/protection diodes included. "Output Clamp Diodes for Inductive Transient Suppression (L293D)"
The pdf makes it seem Vcc2 is the output voltage/supply, for all 4 Half-H outputs. Yes/no? I'm confused, because this page makes it seem that Vcc1/pin16 is the output voltage/supply for Half-H's 1 and 2, and that Vcc2/pin8 is the output voltage/supply for Half-H's 3 and 4. Does this contradict the pdf? And of course, what exactly is Vcc1 for? For others' benefit, could someone post the L293/L293D's block diagram and logic diagram? I don't have a site to host captured pics. I've been messing around with L298's. As a matter of fact, I have one setup right now that I've been playing with stepper motors with. The L298 is a dual h-bridge with up to 2 amps output. My first test was to drive a simple hobby motor which worked great. Since then, I've been playing with steppers driving the L298 with an L297 and a 555 timer. I'm just experimenting right now to get a feel for the chips. So far, I'm pleased. I got the L298's from a guy on e-bay for $4 each shipped. Here's some pics of the setup. I haven't tried the other bridges you mentioned, but this one works well. And then in the table on page five says 4.5 min to 7v max. It appears that VCC1 should be 5v for the logic portion of the chip and VCC2 would be the voltage for driving the motor(s). L293/L293D: Quadruple Half-H Drivers. Bi-directional drive of 2 DC motors, or use for steppers, or... And the PDIP package easily plugs into the breadboard. 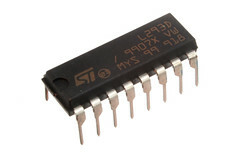 "Vss = Logic Supply = 4.5V to 36V. Vs = Motor Driver Supply = Vss to 36V"
The contradiction within the pdf is also in the newer version of the product (w/diff part number), but now I see that the values are different because the 36V is the absolute max for Vcc1, and 4.5-7V is the recommended range. So I just bought a couple L293D's off eBay for $6 shipped for the pair. I'm dying to try the L293D out, as it seems like it'll be so easy to bi-directionally drive my DC motor. BTW, what are you building?? Anything interesting?? Yes, I saw your proto/perf(? 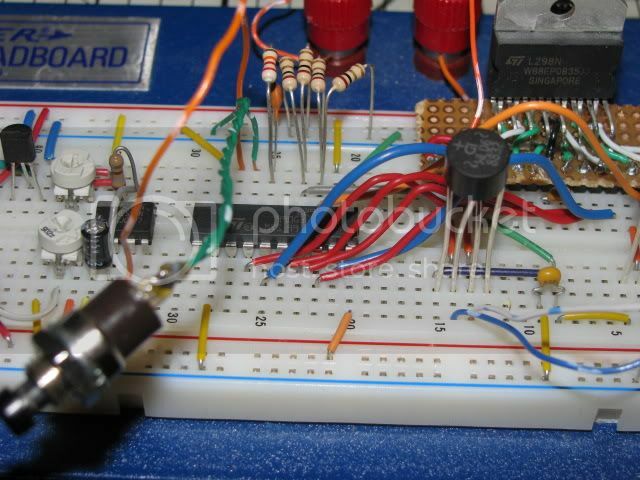 )board soldering to get your L298N breadboardable. I haven't done much soldering yet, so I'm glad the L293D seems to meet my power needs. I think the L293 is rated up to 1A continuous, but the L293D (with protection diodes) is only rated to 0.6A/600mA continuous. But the L293 replacement, SN754410 (that you mentioned), has the protection diodes and* is rated to 1.1A continuous. I'd have gotten SN754410's had I known, and I still may. They're $2.50 shipped on ebay (4 for $9.99). For basic stepper operation, does one just energize the coils in order, for a ~millisecond each? And for low torque apps, doesn't the aligned permanent magnet hold the unenergized stepper motor in place? So your L298N senses current to each coil and outputs 4 signals (0-5V) back to the MCU? Or the L298N itself reads/uses the current sensed? What's the reasoning? Current indicating load, thus changing PWM output power? 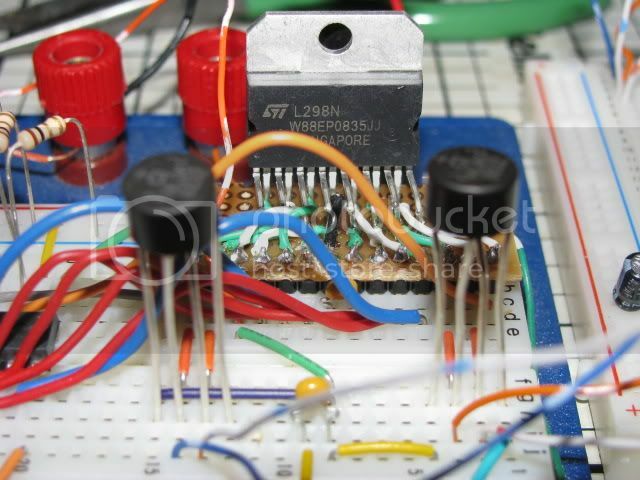 Did you put a capacitor across ground and power into your L298N? How do you size these supply storage caps? And what are the pair of thick hockey puck devices on 4 tall leads on the front of your breadboard? I'm looking to PWM drive the carriage motor on a dismantled inkjet printer to get controlled linear motion via the timing belt and shaft linear guide. Couple options on what this turns into. I also want to drive some steppers for fun. These quadruple Half-H's seem sooo handy! The control output of the 298 is a voltage reference based on the current output of the bridge I believe it tops out at around 2v. There are two controls one for each bridge. The L297 reads this control and varies the on time of the pwm signal it drives the enable line of the bridge with. So by changing a few components, you can set it up to drive a motor efficiently. Steppers are relatively simple to drive, you just sequence the different phase coils in order. The nice thing about the 297 is it does all this in itself and just needs a pulse to increment the motor. Right now I'm driving it with a 555 timer. The 4 hockey puck looking devices are bridge rectifiers (4 diodes in a single package). Normally used to turn AC into pulsed DC. However, here I'm using them as the flyback diodes.